Years ago, when Kevin was small, I discovered Food Network Canada and discovered a serious love for not just cooking, but watching shows about cooking, especially shows with Nigella Lawson. Soon I was signing out her books from the library and pouring over the recipes, eager to try whatever seemed appealing. This recipe became a favorite in our house. 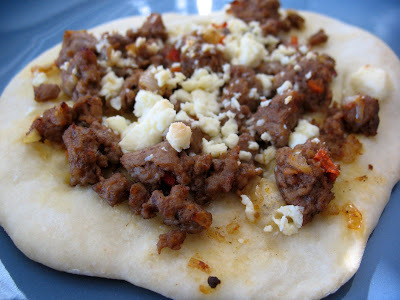 Soft flat bread topped with spicy lamb, and then salty feta, which you just pick up, fold, and devour. Sometimes I make the lamb topping ahead and freeze it. Then sometimes, like this week, I lose the book that I have the recipe written down in so I can't make the flat bready part. And then sometimes I have to google it on the internet, get a totally different recipe, and combine the two; which is exactly what happened, and resulted in me coming up with a totally different recipe altogether. Saute onion and garlic until soft, and then add the lamb, breaking up with a wooden spoon. Continue to cook until the lamb is no longer pink. Drain off the fat and then stir in the cayenne, allspice, cumin, and tomato paste. Stir and cook for a minute longer. Remove from heat and stir in the parsley and lemon juice. Whisk the flour, salt, and yeast together in a bowl. In a separate measuring cup, combine the oil and water. Make a well in the middle of the flour mixture and add the water, then stir until a dough forms. Turn the dough out onto a floured counter and knead for about 5 minutes until smooth and elastic. Place into an oiled bowl and cover with a clean towel or cling wrap. Set it in the oven with the light on (the heat from the bulb will warm the oven a bit) for about an hour, or until doubled in size. When your bread is finished rising, knead it again to get the air out, and then divide into 8 equal pieces and using a rolling pin, roll each piece into a circle/oval approx 5 inches in diameter. Place the rolled out disks onto cookie sheets, and top with the spiced lamb. Crumble feta cheese over top of each lamb topped flat bread. Pre-heat oven to 450 F and bake each pan in the middle of the oven for about 8-10 minutes, until the bottoms are golden brown. Serve immediately. These are amazing if you fold them like a taco and just eat them. One source says to top them with a little fresh parsley and a squeeze of lemon, but we just liked them as is.